More than ever, existing and future workers need to prepare for the changing skills, and often unknown requirements of jobs. This paper provides an overview of occupational skills information practices in selected countries and organisations. The evidence indicates that other nations are making concerted efforts to create such frameworks, populated with contemporary and cross-referenced skills intelligence and maintained close to real time; the aim being to steer policy and inform training practices, which begs the question: what might be adapted from these various examples to benefit Australia? The digital revolution and automation are accelerating changes in the labour market and in workplace skills, changes that are further affected by fluctuations in international and regional economic cycles and employment opportunity. These factors pose a universal policy challenge for all advanced economies and governments. In the workplace, people seek to acquire contemporary and relevant skills to gain employment and retain transferable skills to maintain employment. The central purpose of this paper is to investigate how other nations or regions are dealing with these issues. What approaches are they taking to understanding the mix and dynamics of the skills attained by individuals and, more broadly, the totality of skills that in aggregate constitute a highly capable and adaptable labour force, one that supports firm viability and greater national productivity. This research has examined a range of initiatives and approaches being developed or in use in selected countries, including the United States, Singapore and New Zealand, and agencies/organisations; for example, the European Commission and the Skills for the Information Age Foundation. In doing so, it showcases the good practices used to ensure that occupational-level skills information remains current and widely accessible. International practice is moving to establish and maintain a more dynamic inventory of job-specific skills, with these organised, classified and interrelated by means of a practical skills taxonomy, and set within a coherent skills information framework. Such a categorisation is more detailed than qualifications and occupational titles; these are poor proxies and become outdated by comparison with the real-time skills needed and performed in workplaces. Well-integrated and well-organised skills intelligence is becoming increasingly useful to multiple end-users for many different purposes. Policies to reduce skills imbalances and prepare for future skills in demand can be more successful if they are underpinned by accurate and timely information about skills needs. A good practice approach to this issue is a comprehensive skills framework, into which a variety of data are integrated, including up-to-date information directly sourced from workers and employers, complemented by, for example, online job-vacancy data analyses. This paper, as well as the companion case studies of both international best practice and evolving practice, provides content upon which to reflect on current Australian approaches. These issues appear to deserve separate and wider public discussion. As a preliminary and debatable observation, Australia has multiple and valuable skills information resources and existing repositories, although their full potential remains unrealised, given the lack of an integrating skills framework of the ambition, scope and complexity of other nations. The world of work is changing in ways that make it increasingly difficult for a large proportion of the workforce to gain and maintain consistent employment. More than ever, existing and future workers need to prepare for the changing skills requirements of jobs. With advancements in technology, the skills profiles within jobs, and the jobs themselves, are rapidly evolving, a situation that places huge expectations on national vocational education and training (VET) systems in servicing and responding to the rapidly changing needs of employers, as well as the job aspirations of students. This is a multifaceted public policy issue: workers need contemporary and relevant skills to gain employment and transferable skills to traverse the labour market and so maintain their employment; employers need a highly capable and adaptable workforce; and governments seek to ensure, by means of coherent public policy and efficient investment, effective relationships between students, training providers and employers. So how are other nations addressing the issue of ensuring their workforces possess the skills required for the future? What are other countries or regions doing about skills descriptions, analyses and frameworks to accommodate these skills: how are they approaching the challenge of identifying discrete job skills; of building and maintaining a dynamic inventory of such skills; and of assembling these into a well-organised and practical skills taxonomy, one where interrelated skills are classified and integrated? And, practically how is all of this information collated for the betterment of training? Further, how are skills at different levels to be recognised within such skills frameworks, how do clusters or aggregates of such skills relate to any named occupations, and how can training content and qualifications be responsively adjusted to drive a dynamic training system. In Australia, standardised occupational skills data for informing training is mainly found in training packages, foundation skills frameworks and in occupational standards in classification systems such as ANZSCO (Australian and New Zealand Standard Classification of Occupations). These repositories, particularly the latter, have potentially slower information-update cycles and risk being unable to keep abreast of the rapidly changing employment and occupational requirements. 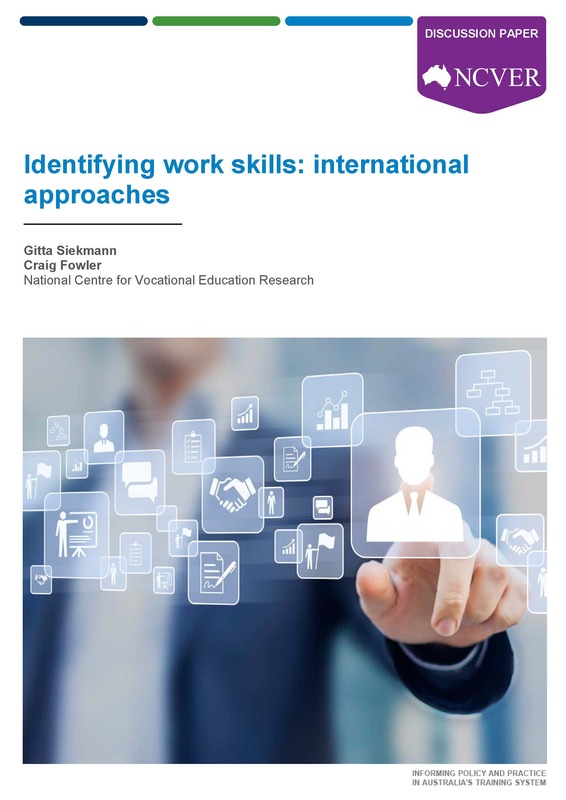 This report provides a summary overview of occupational skills information practices in selected countries and organisations, with the aim of highlighting the approaches adopted by each to the design, content, update and provision of skills information. In addition, it showcases good practice in ensuring such information is current and accessible. We conducted a desktop analysis of the skills information frameworks and systems that were readily available on public websites, along with the associated documentation on these sites. The frameworks and systems identified were mainly government or intergovernmental agency websites (for example, OECD, European Commission). The search particularly focused on the level of detail of skills information within occupations, its currency and accuracy in regard to describing ‘on-job workplace reality’, and evidence of this skilling intelligence being used to update vocational training in a timely manner. Thirteen cases were studied in detail. These came from the following countries, agencies and organisations: United States, United Kingdom, New Zealand, Canada, Finland, Switzerland, Singapore, Organisation for Economic Co-operation and Development (OECD), European Commission, Cedefop (European Centre for the Development of Vocational Training), Skills for the Information Age (SFIA) Foundation, and Burning Glass Technologies. This report summarises the major themes to emerge, with greater detail provided in the support document accompanying this report. Of the organisations and countries, four cases stood out. These were the Occupational Information Network Program, O*NET, from the United States; Singapore’s Skills Framework; the classification of European Skills, Competences, Qualifications and Occupations (ESCO); and an information technology (IT) framework developed by an industry body (SFIA Foundation). Other approaches of merit came from the United Kingdom, New Zealand and Canada. The main features of the identified exemplar organisations are summarised below, while an overview on each follows. A number of features were common to the successful skills information initiatives, including strong governance structures, processes to ensure timely and up-to-date data acquisition, logical structures and taxonomies of skills descriptions, and public access to such skills information. In the good practice skills information systems, the government took the lead, but with stakeholder collaboration and buy-in. Often a dedicated skills agency, the skills information body is linked with an industry organisation or sector-specific councils and has regional representation. Such agencies support skills information initiatives, systems and programs. Every data source has inherent strengths and weaknesses, meaning that drawing from a variety of sources is desirable. These sources include worker, employer and industry surveys, job vacancy and labour market information (LMI), and econometric exercises. The O*NET system provided a good practice example of how to link detailed skills information to the nation’s standard occupation classification system. To ensure currency, new or ‘modified’ occupations are added in an expanded O*NET version of the classification system. Several skills information initiatives aim to act as ‘first stop or one stop websites’, that is, information portals catering for a range of stakeholders. For example, Cedefop envisions skills information access as comprising an interactive platform, supporting data and features that respond to the needs of different types of users — policy-makers, training or career practitioners or experts in skills needs anticipation. While many skills information models and frameworks aim to address this issue, this study was less successful in identifying clear examples of organisations where such skills information rapidly informs training, thus leading to modifications and updating. Worth mentioning here is the Ofsted process in the UK whereby a training provider is assessed on how well the leadership and management team successfully incorporate labour market information into the planning, establishment and management of curriculum and learning programs. As flagged above, the desktop research singled out four international organisations whose approaches to the provision of skills information in meeting the needs and interests of learners, employers, and the local and national community were considered to represent best practice. With a particular focus on providing occupational profile information to students and job seekers, O*NET is the primary source of skills information in the United States. Readily accessible to a range of stakeholders, it uses a common language for defining and describing occupations, while its flexible design can capture changing job requirements. Central to the program is the O*NET database, containing information on hundreds of standardised and occupation-specific descriptors. The model is based on the rationale that every occupation requires a different mix of knowledge, skills and abilities and is performed using a variety of activities and tasks. The model embodies the character of both occupations (via job-oriented descriptors) and people (via worker-oriented descriptors). It also allows occupational information to be applied across jobs, sectors or industries (cross-occupational descriptors) and within occupations (occupational-specific descriptors). O*NET’s main feature is the use of standardised surveys of job incumbents, which request information on the level of skills performed and their perceived importance in the job. Launched in 2016, Singapore’s skills strategy (Skills Futures), aims to make every student and worker responsible for their own learning path. Every Singaporean over the age of 25 years is provided with a lifelong $500 credit to use towards a range of government-supported training and education courses. This strategy makes use of the skills information program — Skills Frameworks — to enable informed decision-making by students, employees, employers and educators. The Skills Frameworks program is being rolled out sector by sector and currently includes hotel and accommodation services, early childhood care and education, precision engineering and sea transport. The Skills Frameworks website aims to provide up-to-date information on employment, career pathways, occupations, job roles and existing and emerging skills, as well as relevant education and training programs. A list of training programs that address skills gaps in each sector is included on the framework website. In July 2017, ESCO, the classification of European Skills, Competences, Qualifications and Occupations, an integrated skills, occupations and qualifications platform was launched, the objective being to aid labour mobility in Europe. ESCO, a multilingual platform, assembles disparate skills information via website-tagging technology (semantic web), identifying and categorising skills, competences, qualifications and occupations relevant to the European Union (EU) labour market and education and training, and systematically shows the relationships between the various elements. ESCO provides information about the skills required when working in a specific occupation or gained as a result of a specific qualification; it also displays the qualifications required or often requested when seeking work in a specific occupation. It is envisaged that, by 2018, the system will possess the capacity to translate across the occupational or skills classifications and similar de facto standards of member nations, helping to strengthen the interconnectivity of national systems and enabling cooperation between member state authorities. SFIA is a globally accepted common language for the skills and competencies required in the digital world. Begun as an initiative in the UK in 2000, this IT skills framework describes itself as the de facto global IT skills framework, now being used in nearly 200 countries by organisations and individuals to characterise and manage skills. SFIA does not define occupational roles or jobs; rather, it delivers flexible building blocks of skills descriptions at various levels of competence. SFIA is a model suited to those fast-changing workplaces that are transitioning static job roles to more flexible project-aligned team-building IT skills. Individuals working in these organisations are described as ‘distributed IT professionals’ and are placed and used as needed throughout organisations. The examples of good practice frameworks demonstrate that occupational skills analyses encapsulate more than merely an analysis of qualifications and occupational titles, given that these can represent poor proxies for the actual discrete skills required and performed in diverse workplaces. Policies to reduce skills imbalances and prepare for future in-demand skills can only be successful if they are underpinned by accurate and timely information about skills needs, which in turn is supported by a comprehensive content model, established from a diversity of data sources, including sourcing information directly from workers and employers via regular and frequent surveys, as well as from online-vacancy data analyses. International best practice typically includes a dedicated skills agency, under the auspices of a national government, whose role is to coordinate skills information services. An important element of the design and construction of a skills information framework is consultation and cooperation with multiple stakeholders. Rethinking how occupational skills information could be analysed, stored and made accessible could provide an opportunity to simplify the structure and update of training products. While this paper did not set out to make comparative analyses between Australia’s situation and international examples and case studies, the findings from the 13 selected examples of international practices (see support document) do prompt reflection on Australia’s present arrangements and offer an evidence base from which future discussion and debate could be initiated. Australia already supports multiple information resources and repositories for existing skills, occupations and qualifications, for example, JobOutlook, managed by the Department of Employment; ANZSCO; training.gov.au; MySkills.gov.au, the Australian Core Skills Framework (ACSF), the Core Skills for Work Development Framework (CSWDF) and the Australian Qualifications Framework (AQF). International evidence and comparisons suggest that the full potential of these various resources may be unrealised, given the lack of an up-to-date and widely accessible integrated skills information framework. From a narrow VET perspective, failing to address the issue of the lack of such a framework may risk the currency of training package information, while standard occupational information is likely to become increasingly disconnected from job reality. The lack of an accessible, comprehensive and up-to-date skills information framework means that individuals may fail to develop the appropriate set of skills for work and employers may have trouble finding people with the right skills sets. The evidence indicates that other nations are making concerted efforts to create such frameworks, populated with contemporary and cross-referenced skills intelligence and maintained close to real time, the aim being to steer policy and inform training practices, which begs the question: what might be adapted from these various examples to benefit Australia? UK Office for Standards in Education, Children's Services and Skills. Semantic web, whereby web pages are structured and tagged in such a way that it can be read directly by computers.